The musical talents of Mollono.Bass and Ava Asante complement each other like motes of dust dancing in the golden sunlight. Together they set to sound the free and easy feeling of a warm summer day: La Vida Colorida. The highly dynamic vibe of this title is based on the principles bass, beats and pressure, but even more so on intense melodic catchiness. Bouncy piano chords take up the streamlined rhythm, soon they are accompanied by the weightless sound of a lively violin, and when the laid-back vocal hits in it comes with a subliminal touch of sunshine Reggae. 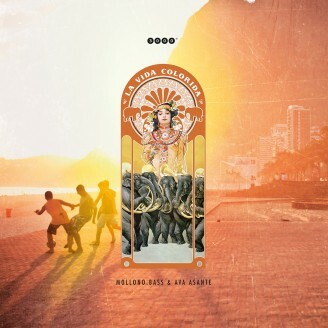 La Vida Colorida comes in a multicolored variety of versions and remixes: Dole & Kom turn the track into a sleek piece of liquefied House Music, whereas Mollono.Bass delivers a jazzy deconstruction that is both sophisticated and highly efficient. For those moments when there is no need for words the EP includes an instrumental version, and for those moments of peak-time euphoria on a sunlit open air dance floor there is a mix by Ava Asante.